A latte is a basic coffee drink you can order at any coffeehouse. The simplicity of espresso and steamed milk makes it popular, but when you're at Starbucks, the options increase exponentially. There are multiple options for milk including non-fat, low-fat, and whole milk, as well as the non-dairy options of coconut milk, almond, and soy milk. You can add flavors, such as vanilla, caramel, or hazelnut as well as seasonal flavors to your heart's content. If you're cutting out sugar, Starbucks' Iced Skinny Latte is a good beverage option. The Iced Skinny Latte with sugar-free syrup uses sucralose, so there are no carbs added if you opt for flavor. If you want to cut down even more on carbs, opt for unsweetened almond milk instead of the standard non-fat milk. You'll also save calories by choosing almond milk; one cup has only a third the calories of skim milk. 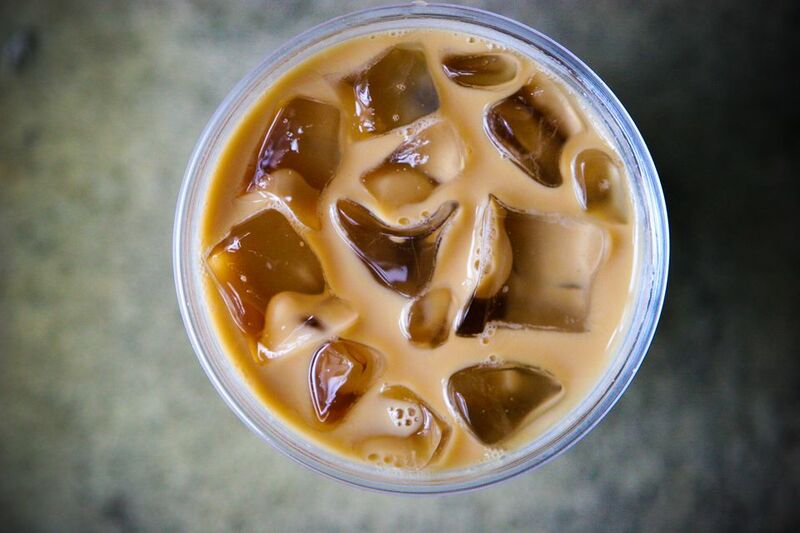 Our signature Espresso Roast combined with fresh, cold nonfat milk, a sugar-free syrup of your choosing and ice. All the taste of a regular latte, only cooler and with fewer calories—80 for a Grande (16 fl oz) to be exact." While the Iced Skinny Vanilla Latte has much less sugar than the regular version available at Starbucks, there is still a downside. When sampling the Starbucks Iced Skinny Latte, the coffee flavor was nice and clean. The consistency of the coffee was very smooth, but the artificial vanilla flavor was off-putting. It had an abrasive quality that overpowered the coffee flavor. You might want to try using less vanilla flavor or more ice for a more balanced drink. Nutritionally speaking, a tall (12 ounces) Starbucks Iced Skinny Latte with non-fat milk has about 60 calories. It also has about 8 grams of sugar, which is about par for other "sugar-free lattes" available on the market. This list of artificial ingredients may not be the healthiest option. Choose your sugar-free drink wisely and be sure to read the ingredients for the full picture. How Many Calories Are in Your Starbucks Order? How Much Sugar Is in Your Starbucks Drunk?